I'm attempting to setup Tor for use behind a Windows 7 firewall, I have set the firewall to block all outgoing traffic except those with a rule and configured it at first allow traffic for the following exe files. But that didn't work so I made Inbound/Outbound allow rules for EVERY exe file I could find in the Tor folder and any subfolder and still no go. 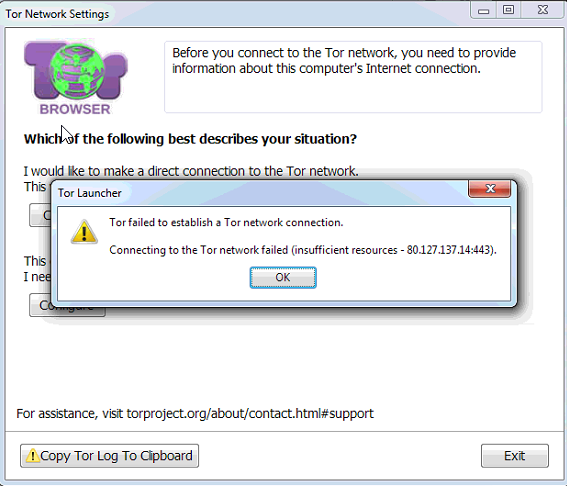 Here is the error I get when attempting to connect to Tor. 8/24/2017 10:40:11 AM.300 [NOTICE] DisableNetwork is set. Tor will not make or accept non-control network connections. Shutting down all existing connections. 8/24/2017 10:40:22 AM.400 [NOTICE] DisableNetwork is set. Tor will not make or accept non-control network connections. Shutting down all existing connections. 8/24/2017 10:40:22 AM.400 [NOTICE] Delaying directory fetches: DisableNetwork is set. Browse other questions tagged windows firewall or ask your own question.